Oklahoma continues to lead the nation in per-pupil education funding cuts, according to a report released Thursday. According to the Center on Budget and Policy Priorities, when adjusted for inflation, Oklahoma’s general per-pupil funding dropped 24 percent between the 2008 and 2016 school years. The second largest cut was in Alabama, where per-pupil funding dropped 17 percent. The report notes that four of the five states with the steepest decline in education funding also cut income tax rates. Those states are Oklahoma, Arizona, Wisconsin and Idaho. Between 2015 and 2016 school years, per-pupil funding slipped by 1.6 percent when adjusted for inflation, according to the report. Total enrollment used in the calculation increased. Twelve states saw per-pupil funding shrink between 2015 and 2016, with Oklahoma seeing the third largest decrease. 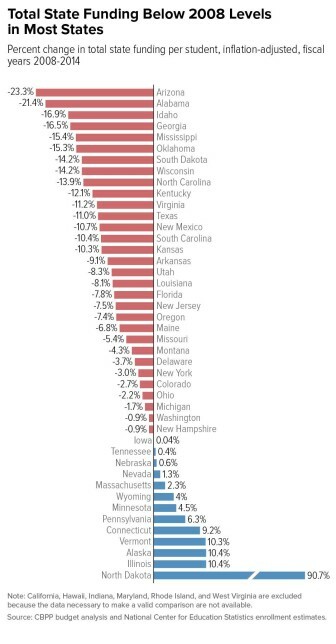 Oklahoma’s decrease comes despite the state budget keeping overall K-12 funding flat in raw dollars. Oklahoma’s overall state funding is down 15 percent from 2008 to 2016, according to the report. That is the sixth largest decrease behind Arizona, Alabama, Idaho, Georgia and Mississippi. Part of the reason for the decrease in many states, according to the report, is that lawmakers relied on funding cuts to get through the worst of the recession. 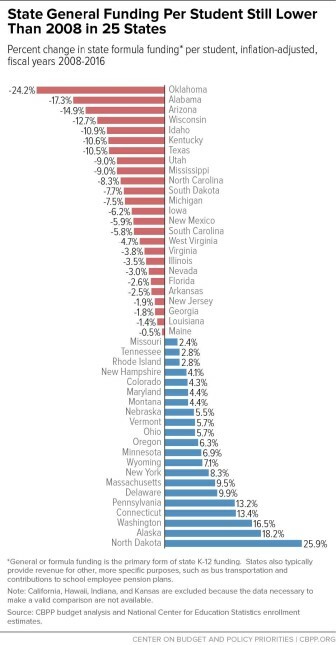 While many states are now putting more money back into education, they’ve yet to reach pre-recession funding levels. The loss in state aid was also compounded by a decrease in federal aid. Things are not expected to get better financially for education in Oklahoma during the next year. The state faces a budget shortfall that could range from $600 million to $1 billion heading into the 2017 fiscal year. A proposed petition for a penny sales-tax hike for education, allowing teachers to get a $5,000 pay raise and pumping funds into career tech and higher education, faces a court hearing. If the petition survives the hearing, which is focused on the constitutionality of the measure, it still needs to garner enough signatures to appear on the 2017 ballot and then get approval from voters. The penny sales tax would not take effect until 2018 at the earliest.